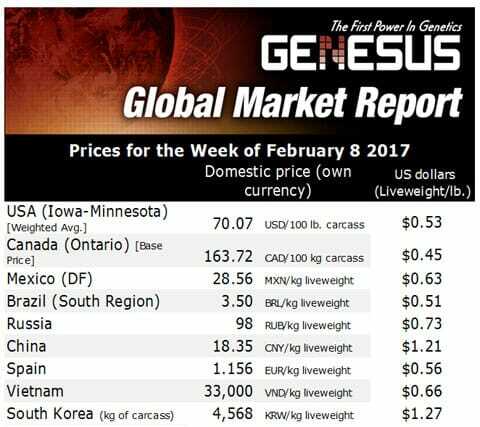 RUSSIA - The pig price this week in Russia is averaging 98 Roubles ($1.66) per live kg., writes Simon Grey, General Manager of Genesus Russia. Pork consumption increased during 2016 by 7 per cent to 24.9kg per person. With companies beginning to export into Asia the future remains bright. There are some peculiarities within the Russian market, and some anomalies which make no sense! Majority of pigs produced and slaughtered and sold by large integrated producers, there is a limited ‘free market’. Large producers set their own prices. Russian pig businesses target and measure their production in tonnes of pig meat sold. In Russia today the value of a 1/2 carcass and the value of pig fat are both in the 130 to 140 Roubles per kg range ($2.21 to $2.38). The highest value cut on meat in Russia is Neck (Russians like fat). The cull sow price is relatively high in comparison to slaughter price (74 per cent ), meaning cull sow value is about 6000 Roubles ($100) higher than that of a standard slaughter pig. Farms producing their own gilts and paying a royalty to a breeding company make a profit selling a cull sow and replacing it with a gilt. The anomaly is that the Russian grading system penalises fatter (and therefore larger) carcasses and many new plants built by the large integrators are using lean meat per cent as the only measure of carcass value! When talking with producers over the past few weeks, most think that less fat is the major market driver. I have heard several smaller, independent producers say that who they sell to want leaner pigs and are considering reducing slaughter weights to comply to slaughter plant demand. Genesus recently took part in a major sire line trial. We were very clear winners in terms of slaughter weight (9kg and 7kg higher slaughter weight in same time vs the competitors). We were then told that according to Autofom measurements, the weight of primal’s was lower than competitors. This is of course impossible! It is important that slaughter plants understand the major drivers of profitability for their business. What is the most profitable pig to kill, weight, lean per cent, backfat, meat quality (pH, colour, tenderness, intramuscular fat). Also, you need to consider the value of all of the other parts of the pig. There is an old English saying: “you can use every bit of the pig except the squeak”. Blood, intestine, offal, ears, bones, skin, ears etc. all have potential value. In the USA, several years ago, Smithfield Foods looked properly at what is the major driver for profitability. Their finding after doing very thorough analysis was that carcass weight was the single most important factor related to profitability. They discovered also that back fat / lean per cent cost had almost no impact and that it actually cost more to measure than it was worth. Today, 50 per cent of plants in North America have stopped any form of grading for backfat and the remaining 50 per cent have for now changed the emphasis in their contracts from lean to weight. We are beginning to see the same trend in Europe, especially Spain which is by far Europe’s most progressive industry, and most similar to North America in structure. Spain, a major exporter of pork, in reaction to sanctions with Russia has been developing export markets to Asia. Asia requires pork with better meat eating qualities. Colour and intramuscular fat are important. As a result some plants are now asking for minimum levels of back fat to be 2cm! Even in Germany, the country where farmers are paid for lean meat and Pietrain has been the only choice of sire for many years, plants are beginning to look for alternative and tastier meat. Even fat obsessed European consumers seem to at last be getting tired of dry tasteless pale pork! In North America and Europe there is a bigger difference in the price of fat Vs ½ carcass. There are still consumer preferences in many places for lean (it is assumed to be healthier). In these markets it is becoming clear that carcass weight is the major driver of profitability. In Russia, where consumers prefer fatter pork and the price of fat is high, carcass weight HAS TO BE the major driver of profitability. It seems to me that if plants turned off their expensive grading machines and spent time properly evaluating which is the most profitable pig it will become clear. It seems that a country where targets and results are set and measured in tonnes of pig meat already knew the answer. I have said many times before, with regards the pig industry, Russia has absolutely nothing in common with Europe and everything in common with North America! It seems European influence and technology may have pushed the Russian market in the wrong direction? To grow the pig industry, Russia needs to increase local consumption, remember that Russians like fat pork! Russia needs to develop the Asian export market where good meat eating quality is vital. At the core of the Genesus breeding program is more tonnes of pig meat sold from a pig business. More pigs sold per sow per year and faster growth rates giving heavier carcass weight. Genesus has put more time and effort than any other breeding company into maximising meat eating quality. More tonnes of better meat = maximum profit!